Join over 175+ Mountaineers here in the Low Country of South Carolina to help raise money for our Charles Drake Memorial Scholarship Fund! This is a great family friendly event and is our largest fundraiser of the year! Enjoy all you can eat BBQ from Martin's BBQ Joint, delicious southern side dishes, WV's own Mister Bee's Potato Chips, dessert, sweet tea, soft drinks, wine and ice cold beer! 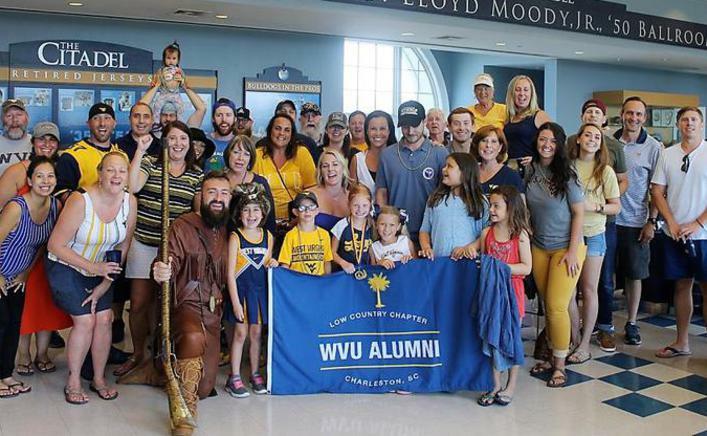 Special guests include the Mountaineer Mascot, Timothy Eads, Candace Nelson, author of "The West Virginia Pepperoni Roll" and many more to be announced! Live entertainment provided by High 5 Duo! Enter in the PEPPERONI ROLL BAKE-OFF for a chance to win a $50.00 gift card, a trophy and bragging rights for 1 year! Click here to get instructions! Jump castle, corn hole and more! Scholarship Raffle & Silent Auction! We are currently seeking raffle prizes and silent auction items for our BBQ Bash raffle & silent auction to help raise money for our Charles Drake Memorial Scholarship Fund. Please email us at lowcountryeers@yahoo.com if you or your business would like to donate some items! Become a BBQ Bash Sponsor! Tax-deductible sponsorship's are available to help us cover the costs associated with planning and executing the BBQ Bash, so that 100% of the proceeds from the day can go towards our scholarship fund. If you or your business would like to become a sponsor, please click HERE.